If your healthy cat is suddenly peeing on your bed, or spraying in your office; if he’s taken to running around at strange hours of the night, or mewing inconsolably all night, there are several possible explanations. Of course, your first step is to take them in for a vet check to eliminate any possible health conditions like urinary blockages or other illness. 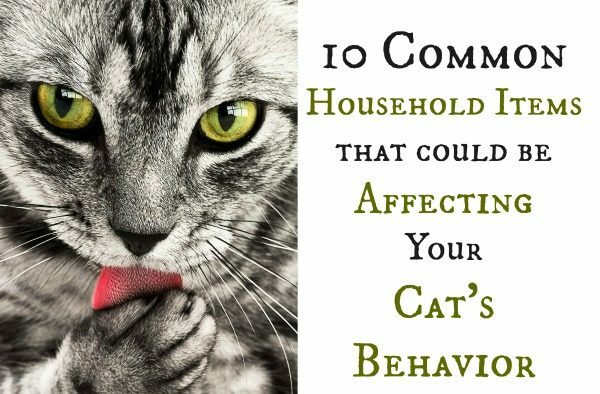 But if health problems have been eliminated and your cat is still acting inappropriately, we have some ideas on what might be causing the behavior and how you can resolve the problem. Everyone has probably used a room deodorizer in their home, particularly if they have cats. One of the most common places to put diffusers and other such items are near the litter-box. Avoid doing this! It can cause undue stress on your cats and even make it difficult for them to use the litter box. Solve This: Instead of placing a deodorizer or air filter near your cat’s box, try one of the helpful Litter Box Deodorizers on the market. You can also tape activated charcoal on the side or the bottom of the box or sprinkle the box with baking soda prior to putting cat litter inside. Have you recently started using essential oils in your home or on your person? If so, your pet could be reacting negatively to these oils – particularly if you are working with citrus or tree-based oils. Don’t get me wrong – essential oils can be very beneficial to your cats (when used properly), but they can also be very irritating and even toxic when the wrong oils are used (or they are used incorrectly). Learn more about what your cat can and cannot have diffused in a home by reading Using Essential Oils and Natural Remedies on Cats. Solve this: Always AVOID citrus or tree-based oils. Only diffuse plant-based oils, such as Lavender and Roman Chamomile. You should only use pure and high grade oils. If you’re using a strong-smelling oil, go outside to apply them – this will go a long way towards helping your sensitive animals. Any harsh chemicals can be very difficult for cats. Some cleaners are very aromatic and can create stress in your cats. Try using some of these natural cleaners, or stick with basic vinegar, water, baking soda, and ammonia (depending on what you’re cleaning!). Solve this: Change to low impact natural cleaners like those available from Ava Anderson and other Safe Cleaners for Pets and People. These days, there are many natural cleaner manufacturers. Cats are not big fans of change. If you have added a new person or animal to your home or even just changed furniture around, the stress of the new smells and unusual activity could contribute to your pets behavior. Solve this: Properly introduce new additions to the household to your cats. There are many ways you can do this and we have listed many in the past. Cats take a little more time to become accustomed to new routines and activity, so be patient and give your best friend the time he or she needs to adjust. There may be a new cat, or even a wild bobcat, stalking your patio or walking your fence line at night. This type of activity could be causing your cat to act out in the form of redirected aggression as they become frustrated with their inability to resolve territorial disputes. Solve this: Read this article to learn how to deal with feral cats in your yard. There are a number of devices and tricks that can assist you in keeping stray animals and wildlife from your yard. Cats are very intelligent creatures. If your cat is spending long hours alone or doesn’t feel stimulated during their waking hours, they will often act out. A bored cat is one who will inadvertently have behavior problems. There are many ways to resolve this problem and we encourage you to find a solution that works. Solve this: Use smart cat toys , interactive cat feeders , and introduce “scavenger hunts” with food before you leave for work during the day. These tricks can go a long way towards keeping your cats entertained. Other things that can really help your cat stay active include an interactive environment. Merely adding a climbing trees, specialized “cat shelves“, or even a catio or cat enclosure can help increase activity, which is great both physically and mentally. Changes in your normal routine due to illness, moving or any other factor can sometimes cause the insecure cat to act out more than usual. If you had to leave town and have come back to a cat with behavior issues, it’s not that they are trying to get back at you, they are merely coping. Solve this: Introduce change as gradually as possible. If you’re planning on moving, begin leaving your cat’s carrier out in the home so they feel more comfortable in it. If you have a new addition to the household (child or friend) begin introducing the person gradually so your cat has a chance to become accustomed to noises, scents and sights. This is a good time to integrate new activities to your cat’s life, such as walking on a leash with a harness, a hunting expedition during feeding time, exploration of the home, and exercise. Catnip and Valerian Root (or Silver Vine ) can be very helpful while you’re gone as they provide a “sedative” effect on many cats. Before you leave, explore new ways to make your cat a bit more social – this will help them react better to your absence. Most cats are introverts and new people or parties will affect them the same way it affects an introvert. It drains them and causes fear. Introduce your cat to a quiet area (closet or hamper) or better yet, teach them that the carrier is not a bad thing. Carriers can give cats a place to call their own, and if you choose the proper carrier, you will have a huge benefit in case of evacuation. Think about the carriers available from Sleepypod – these are amazing carriers for cats and can double as heated or cooled beds. Solve this: If your cat is quite sensitive to new things, consider using a natural remedy, such as Bach Rescue Remedy or Feliway . These will go a long way towards eliminating stress during the holidays. Be sure you offer your cat a safe place to retreat in the event they want to disappear for awhile. Solve this: Turn it down! Wear headphones! It’s proven that animals respond much better to classical music, although you may want to avoid heavy operas (like Wagner’s Ring trilogy). Some of our cat’s favorites include Bach, Mozart and other “light” classical. Celtic music also seems to work particularly well with our cats (Enya is one of their personal favorites). If you don’t enjoy or understand classical music, order a special cat music CD for your pet and put it on when you aren’t at home. If you’ve lost a job, a family member or another pet – there is a very good chance your cats are picking up on that stress. The more stressed you are, the more your cats will begin to act out. Solve this: Take advantage of your cats innate ability to resolve your stress. Cats create purr vibrations in the 20-140Hz range, which has been scientifically proven to be medically beneficial. Purring can help lower your heart rate, relax and calm you, and even help solve problems with depression. Our cats are better than a antidepressant! We hope this article helps you resolve some of your cats behavioral issues that result from stress. If so, please share with your friends so that we may keep more animals in happy homes. Too often, cats are turned over to animal control facilities or put to sleep over a problem that can be resolved quite easily.